If you love to read – or you just love books, whether you actually read them or not – consider creating a home library. Most people who don’t have a home library think that they don’t have enough space. 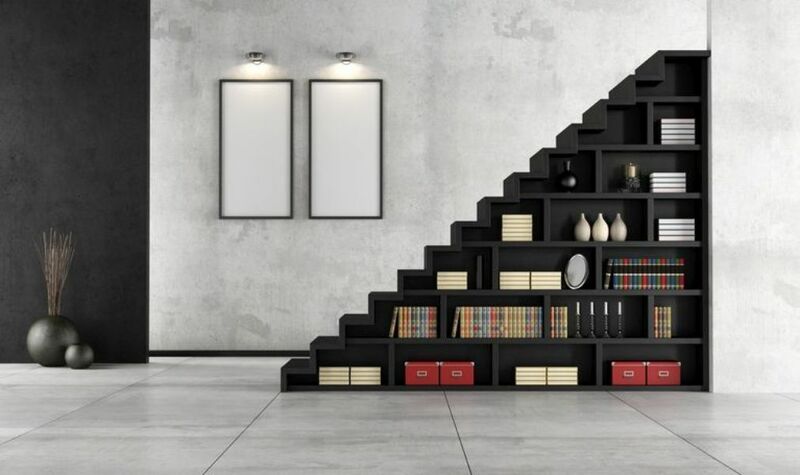 But, by thinking creatively, you can find enough room to house your own books. 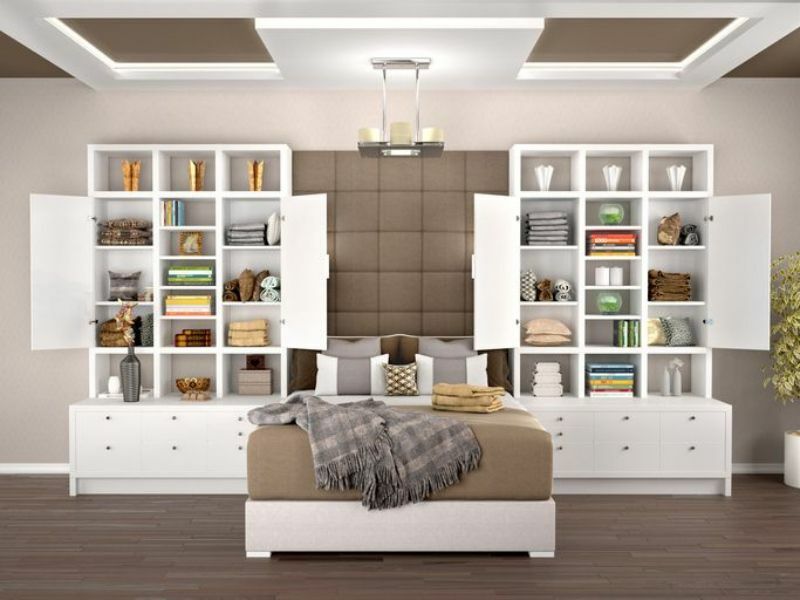 You don’t need thousands – or even hundreds – of books, and you don’t need wall-to-wall, ceiling-to-floor space. 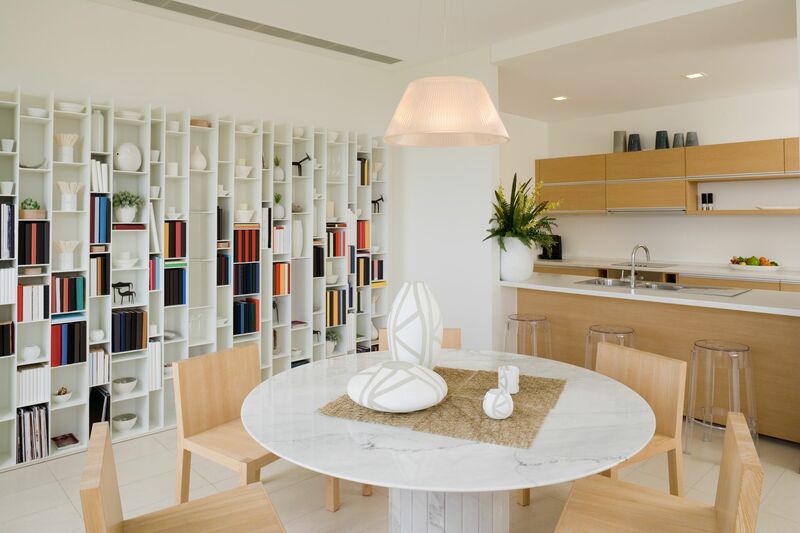 Below are some options for finding space to create a library that meets your needs and design aesthetic. How often do you fall asleep while reading? 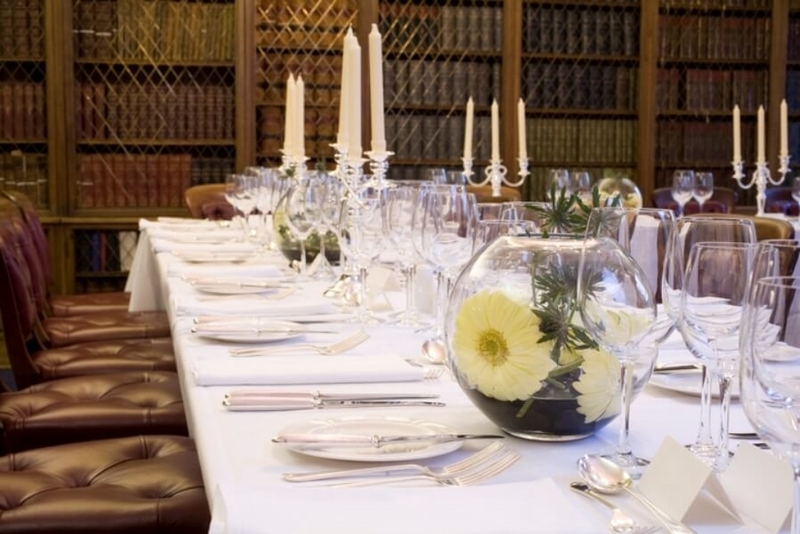 You might as well put your library in one of your bedrooms. 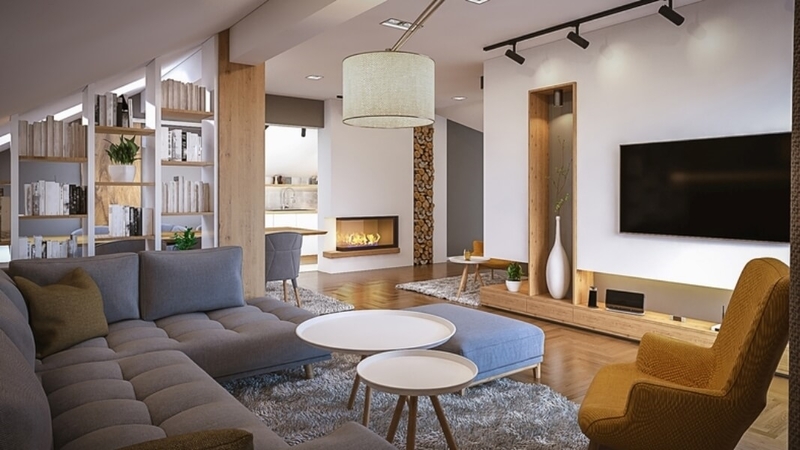 If you have a second bedroom that you only need to use a few times a year, Gentry recommends investing in a fold-out loveseat or sofa so you can turn this room into a library. “Be sure to create a cozy mood, and use comfy seating,” she says. 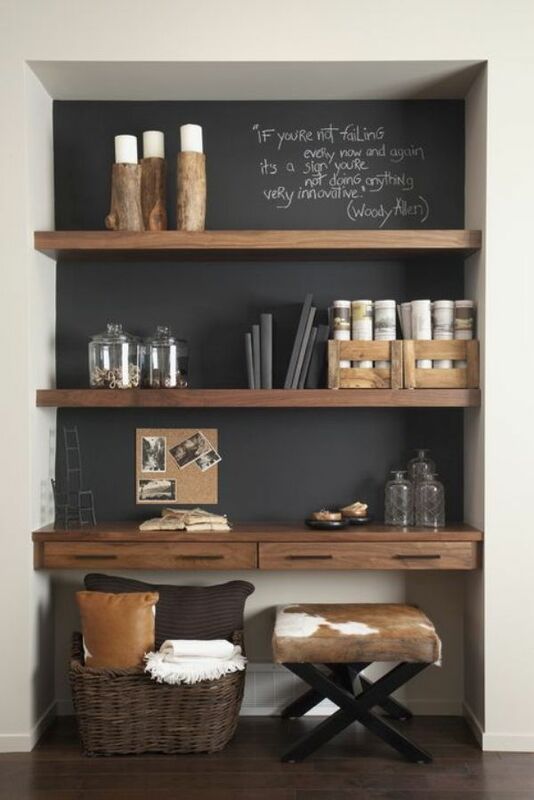 Gentry also recommends filling a focal wall with floor-to-ceiling bookshelves to create a library feel. Josie Abate at Ambience Express agrees and adds, “Built-in shelving can accommodate any size space so you can easily squeeze a home library in any room of the home, whether it be a bedroom or a corner of your living room.” She suggests adding a bench under a window with shelving around it for the perfect place to curl up with a good book. 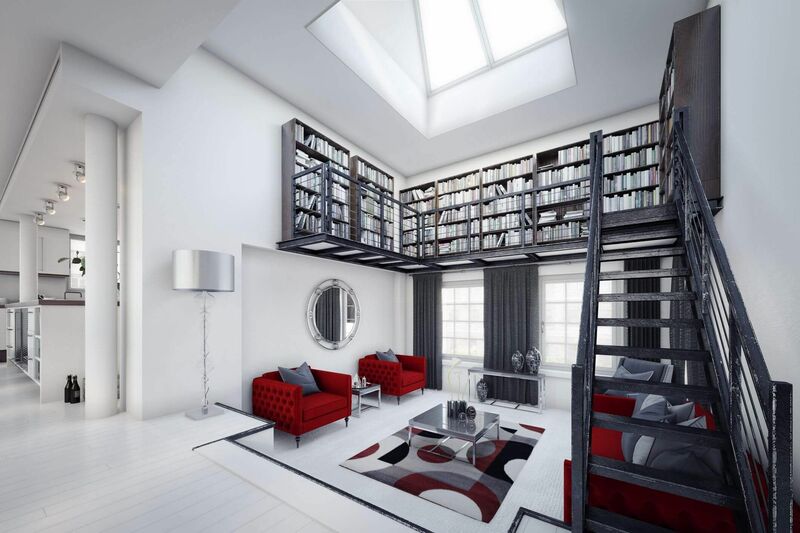 If you have a home office, donate one of the walls to create a floor-to-ceiling library. 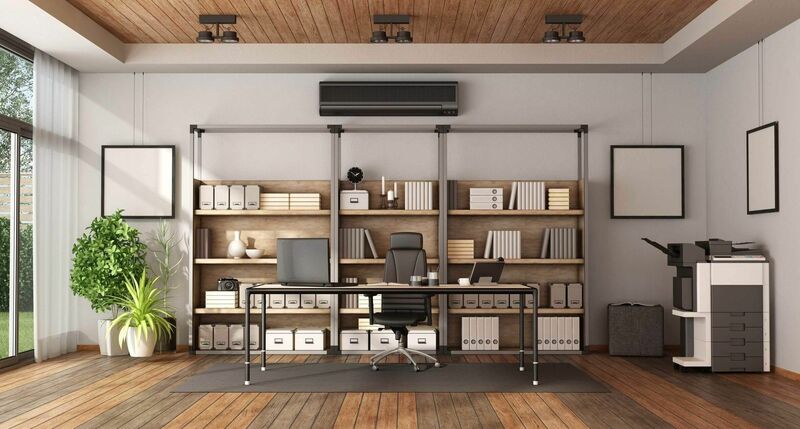 If you’re worried about the space you might lose, remember that you can also put most of your office equipment on the shelves. 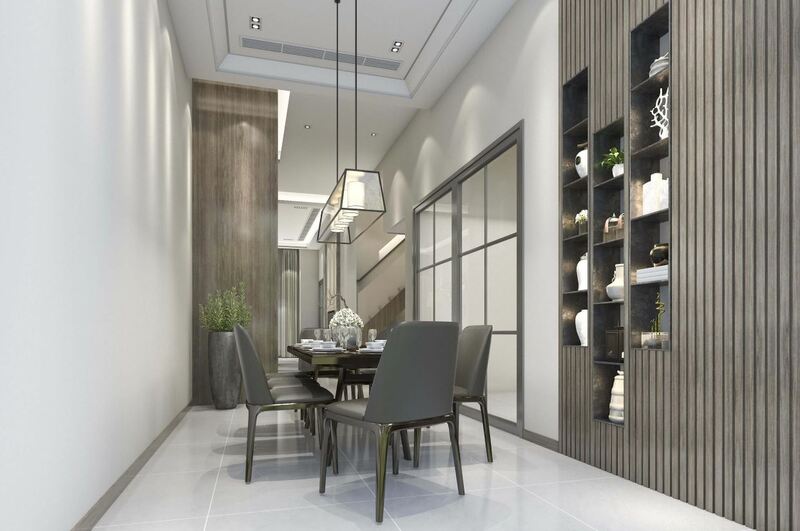 “Often, people store their books in the closets of ordinary entertainment centers, according to Katy Brut, interior design consultant at NY Furniture Outlets. She says it’s important to decide if you want to display your books to everyone, perhaps next to photos and souvenirs, or if you would rather keep your collection private. This will determine if you should get open or closed bookshelves. 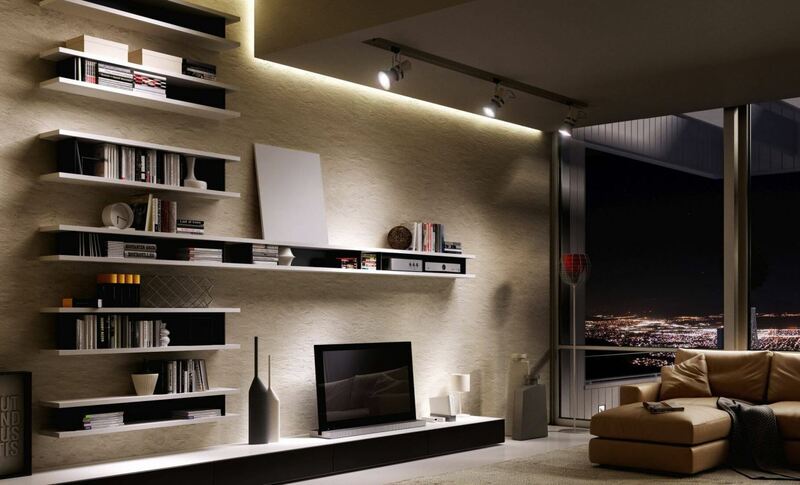 If you don’t have a lot of floor space around your entertainment center, consider mounting slimline bookshelves. 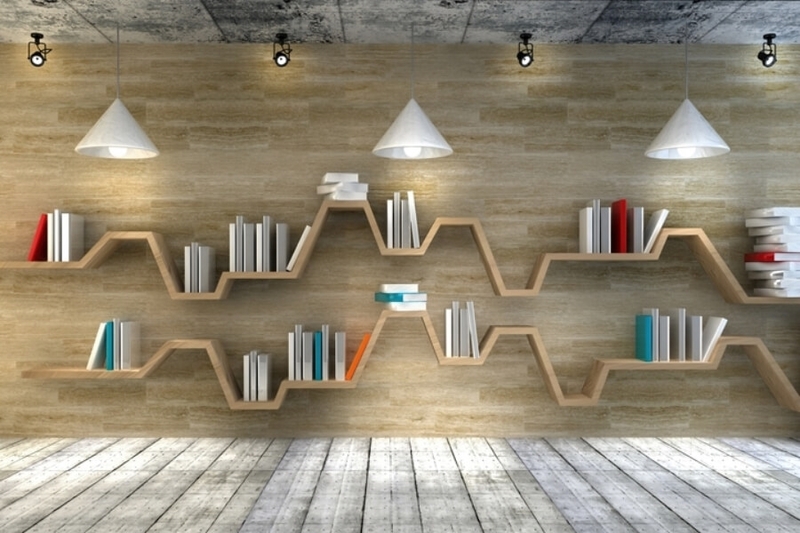 If you don’t want traditional rows of bookshelves, consider this type of shelving, which doesn’t take up a lot of visual space, and can also double as artwork. An attic library also provides solitude. Image: onurdongel/Getty Images. 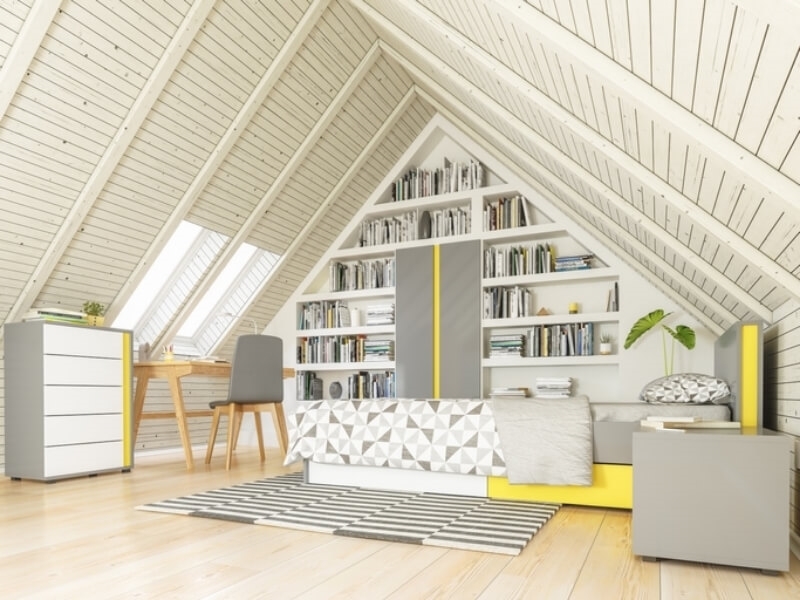 If you have a finished attic, it’s another ideal location for a library. 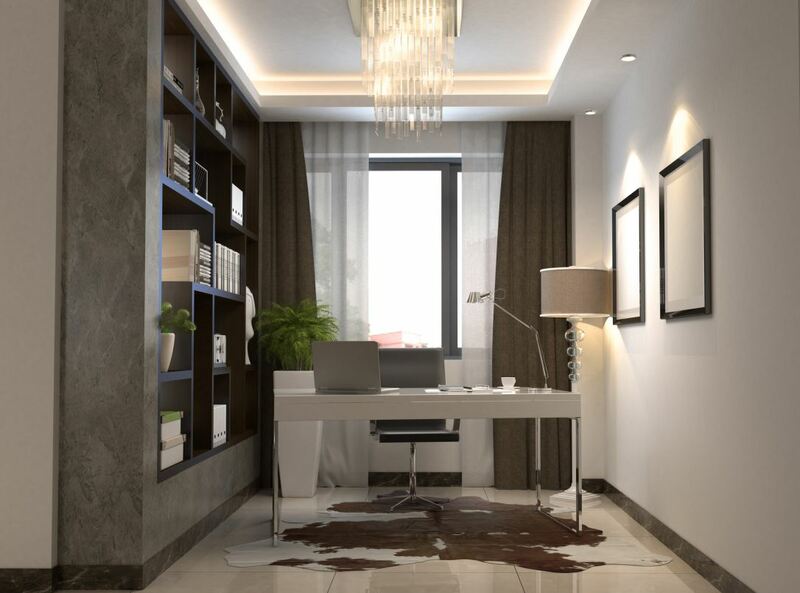 You can carve space out of your walls, so you won’t have to take up any floor space. “Is there an odd nook that never made any since to you?” asks Justin Riodan, founder of Portland-based Spade and Archer Design Agency. “Maybe a staircase where a dead space has troubled you for years.” Those areas provide plenty of library space. 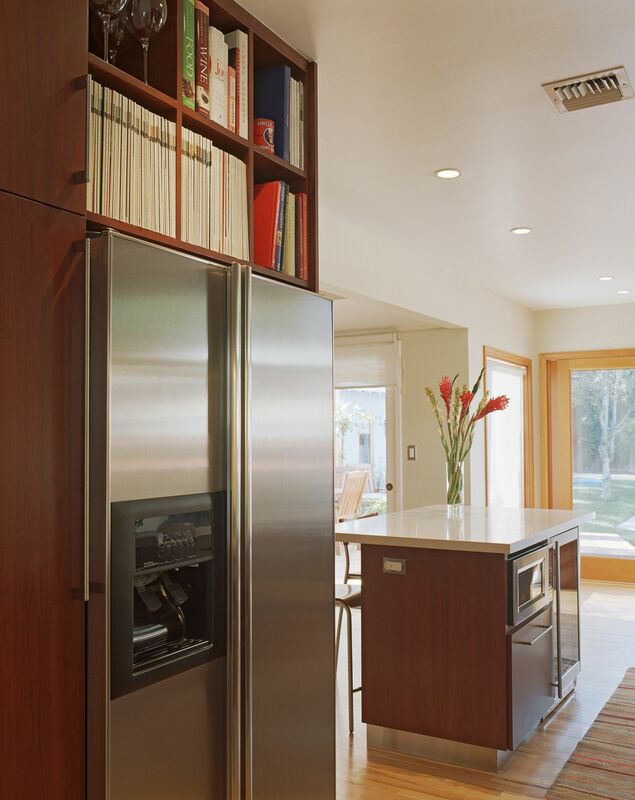 And if you have tall ceilings, you can also take advantage of wasted space higher up. 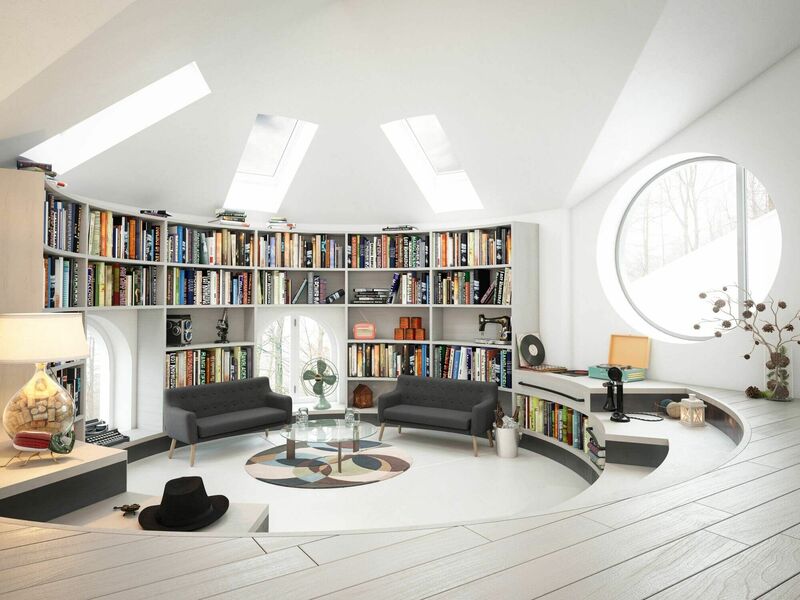 In the photo above, the homeowners created a library at the top of the room. Sometimes, it’s hard to design around and decorate circular areas. However, curving a wall of bookshelves is the perfect solution. And the windows allow plenty of natural light into the library. Totty also recommends using medium to darker stained wood finishes. “This will create a stately and traditional library look,” she says. 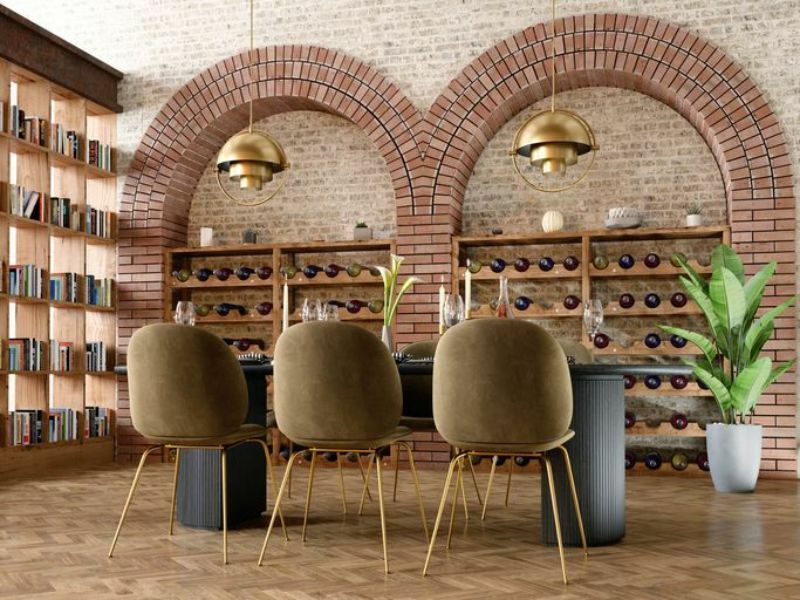 “Add a couple of comfy leather chairs, a large area rug, and floor and table lights for task lighting.” Or, you could use dark wood on the floor. 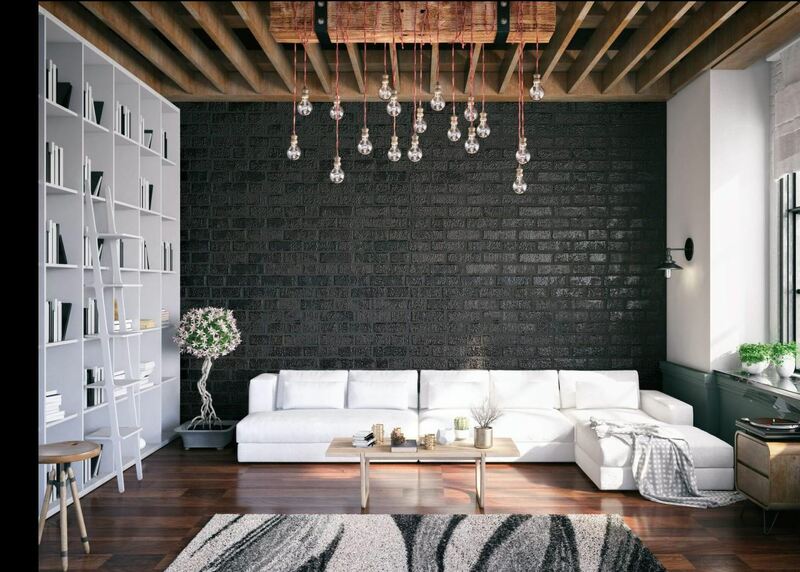 Since black is the stylish color of every year, you could paint one wall black, and make the other walls and the bookshelves white. The post Think You Don’t Have Space for a Home Library? Think Again appeared first on Freshome.com.